Pu-erh Tea, Reishi, and Cistanche help to support a balanced and healthy immune system by keeping the proper ratio of naive T cells and memory T cells. 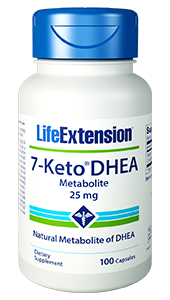 Supports apoptosis, and natural killer cells to give a more youthful and robust immune response. Purchasing this product today earns you 30 DR Reward Points! Supports a balanced and healthy immune system. Helps to boost the production of naive T cells and combat senescence. Reishi supports anti-cancer effects alone or in combination with chemotherapy or radiotherapy. 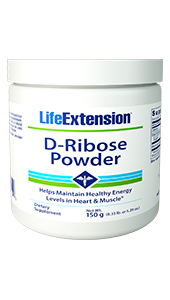 A dual-extract formulation for year-round immune support. Helps to combat the aging process. As the human body ages, the immune system tends to decline, making us more susceptible to colds, viruses, bacteria, and disease. To keep a healthy and robust immune system, there must be a fine balance within the production of naive T cells and memory T cells. The naive T cells are the first cells to attack a new and foreign invader. Once they have attacked the new invader they become a memory T cell, which only attacks what it remembers.1 We need a healthy balance of the two types of T cells, in order to protect the body from new threats and to maintain immunity from old threats. As we age, the naive T cells lower their production, offsetting the balance and leaving us with a gap in protection from new threats. 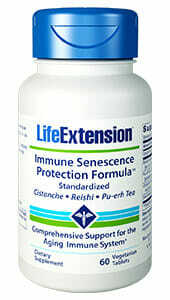 Immune Senescence Protection Formula is an innovative dual-mechanism formula designed to support both the naive T cells, and the memory T cells in order to increase overall immunity and health.2 It supports the production of naive T cells while helping to support apoptosis to keep memory T cells from building up throwing off the balance. Immune Senescence has been reformulated so that it now provides three potent ingredients designed to work in a complementary fashion to help rebalance the major arms of the aging immune system. It now includes Pu-Erh tea extract—providing additional and unique protection for the aging immune system! Cistanche – Cistanche helps to rejuvenate the immune system by stimulating the development of naive T cells and helping to create a more youthful and healthy immune response. Studies have shown significant improvements in immune factors and an increase in natural killer cells after 12 weeks of supplementation. 3. Available at: https://www.nia.nih.gov/health/publication/biology-aging/ immune-system-can-your-immune-system-still-defend-you-you-age . Accessed September 25, 2014. 4. Immunity. 2008 Dec 19;29(6):848-62. 5. Evid-Based Compl Alt. 2014;2014: 601383. 7. Am J Chin Med. 2011;39(1):15-27. 8. Available at: http://www.merckmanu­als.com/home/immune_disorders/ biology_of_the_immune_system/overview_of_the_immune_system.html . Accessed September 25, 2014. 10. Am-Euras. J. Bot. 2008;1(3):107-11. 11. Bioorg Med Chem. 2010 Dec 15;18(24):8583-91. 13. Int J Med Mushrooms. 2011;13(5):441-8. 16. Immun Ageing. 2012 Jul 25;9(1):15.